Tour Builder with Google Earth – pin locations, then add your own photos, videos, text. When you finish, click your way through your tour of the world. This would make a great travel diary, or digital storytelling project! 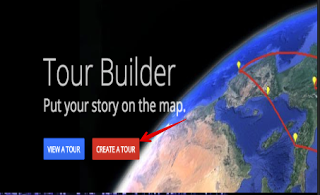 Fun fact: Tour Builder was originally designed for veterans to record their military tours and preserve their stories for their families. Google My Maps – make your own custom Google Map. Pin a location, add photos, video, and text. You can categorize locations for ease of viewing, and it’s easy to collaborate on a map with friends. The Latin 2 class is building a “Where I am from, where I have been” map to visualize their roots and their travels! We are marking our family in blue, our ancestors in purple, and our travels in orange. 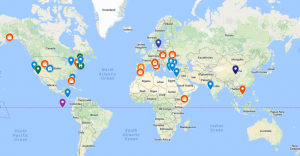 It’s a wonderful way to visualize our global classroom and our connections around the globe. How do you use maps in your classroom? Let us know in the comments below! Students had interviewed family friends or relatives who were immigrants. We then put the information together on the map to show the countries of origin as well as where immigrants settled in America. I am still working the kinks out, but I think there is a ton of potential here, especially if we enhanced it by embedding audio or photos when you click on a location. Thanks for bringing such a great tool to our attention!